This is really 3 (optional 4) recipes that come together to become one complete dessert. The individual recipes can be used for other things too! The strawberry broth can be used for waffles, pancakes, or ice cream topping. 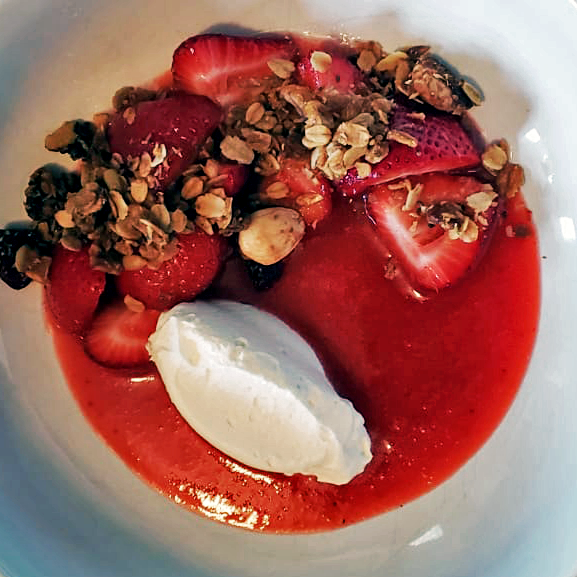 The Macerated strawberries can be used in the same way or as a dessert on their own. The Mascarpone cream can be used like whipped cream, it is just lasting longer than traditional whipped cream. I have a recipe for the granola, but any store-bought vanilla or honey granola works. This dessert can also be dairy free by making whipped coconut cream to replace the mascarpone cream. Combine in non-reactive bowl (plastic or glass) and set aside at least 2 hours until macerated; strawberries have created ample juice to soak. Once juice is formed and strawberries are still firm but sweet, remove them from liquid and strain. Combine all ingredients in a non-reactive bowl (plastic or glass) and set aside for 2 hours or until the strawberries have become macerated. Once macerated, place contents of bowl in blender. Blend on high until smooth. Remove strawberry seeds by straining into another non-reactive bowl using a chinois, tames, or a rounded flour sifter. Sweeten to taste. Sometimes the natural sugars of the strawberries vary, so add more sugar if it isn't sweet enough to your liking. Combine all ingredients in stand mixer or hand mixer and beat on high until light and fluffy. Line sheet pan with parchment. Combine all ingredients in a bowl and stir until coated well. Spread out on sheet pan in one even layer. Bake for 20 minutes and turn sheet pan. Bake another 20 minutes and stir. Keep checking, turning and stirring until golden brown. Cool. • Pour Strawberry Broth into bottom of bowls. • Dollop the mascarpone cream into the broth.